Our patient came to us on December 23, 2014 to have beard hair grafts placed in his strip scar. 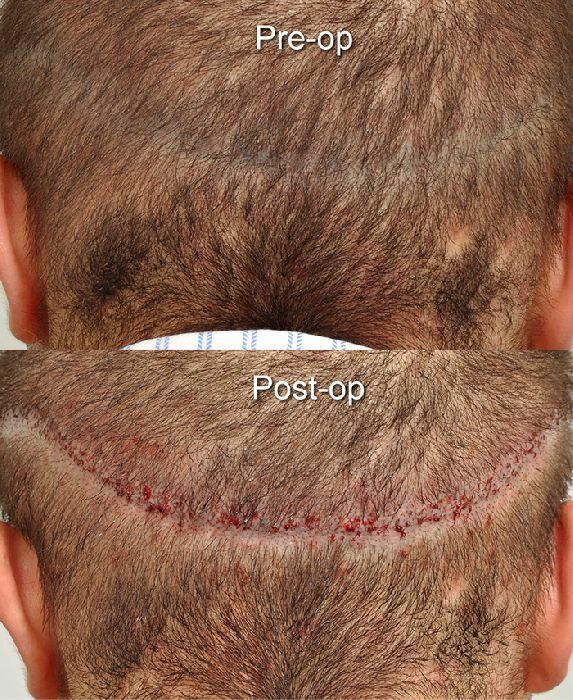 When our patient was 22, he had a strip procedure at one of the big chain, hair transplant outfits. He received approximately 1,500 grafts at that time and was left with a widened scar from ear to ear. He had SMP performed at another clinic that camouflaged his scar to some degree (see photo on top). Many patients prefer temporary ink. This way, should there be a color change, corrections are a lot simpler and less expensive. The 200 beard hair grafts placed into his strip scar will further improve the appearance of his scar.